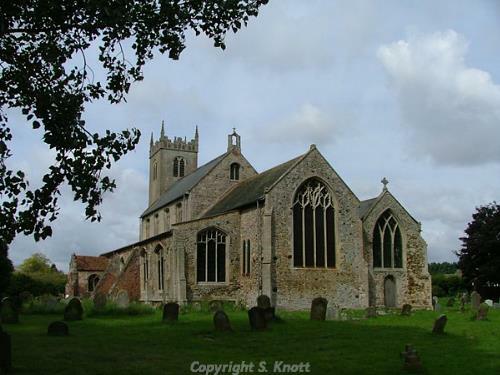 Wiggenhall St Germans is a large parish situated in the very west of the county, just 6 km from King’s Lynn. The parish has an area of 1891 hectares and is part of the West Norfolk Local Government District, and is bisected by the River Great Ouse. The parish is predominantly agricultural, with some pasture and orchards. The name ‘Wiggenhall’ is thought to derive from the Old English for Wicga’s nook, and the reference to St Germans relates to the dedication of the parish church. The former parish of Wiggenhall St Peters was included within the boundaries of this parish in 1935, and more recently the former parish of Wiggenhall St Mary the Virgin was also included. During the majority of the prehistoric period it is thought that the parish was largely marshlands, and is likely to have been waterlogged and may have been prone to flooding. It is therefore thought unlikely that the parish was occupied during the prehistoric period. The area around the village of Wiggenhall St Germans would have been crossed by the Great Marshlands River, an Iron Age watercourse that would eventually silt up until the Roman period, when the Great Ouse would emerge as the dominant watercourse in the area. A small number of prehistoric objects have been recovered, and these comprise a Neolithic or Early Bronze Age stone hammer (NHER 2242), a Neolithic flint ‘saw’ (NHER 2255), a Late Bronze Age spearhead (NHER 34435) and a small number of Iron Age pottery sherds (NHER 22515). It is possible that these may have been deposited by the changing watercourses. A small number of Roman objects have been recovered, and interestingly this includes pottery sherds from two fields (NHER 19035 and 19136) in the southeast of the parish. They are situated near to the eastern end of the Aylmer Roman Canal (NHER 25333), and may be indicative of some very low density or short duration settlement. The only other Roman period objects are a coin minted under the emperor Hadrian (NHER 2273), and a possible Roman or Early Saxon glass bead (NHER 2246). Although no confirmed objects from the Early Saxon period have been recorded, there is one concentration of Middle Saxon pottery sherds (NHER 21940) noted in a field between the River Great Ouse and the hamlet of Saddle Bow, as well as a smaller number from an adjacent field (NHER 23146). It is interesting to note that further pottery sherds from the Late Saxon period have also been recovered in this area (NHER 21940, 23579, 23146, 23049 and 23586), indicating the exploitation of this land continued through these periods. This would become the Pinfold Green settlement, which is first mentioned in documents around 1276. The discovery of Late Saxon pottery sherds in two fields (NHER 23574 and 22515) on the east bank of the River Great Ouse close to the village of Wiggenhall St Germans may indicate that early settlement may have occurred under the present village. Also of interest is a Late Saxon Ringerike finial (NHER 23146), recovered during metal detecting activity. Investigation of the early settlements is hampered by the habit of literary authors of referring to all the Wiggenhall settlements under one name. Thus the Domesday Book of 1086 lists only one ‘Wiggenhall’, and although the settlement does not appear to have been particularly populous, it was highly valued. As a result, the earliest confirmed settlement evidence can be found in the medieval periods. Perhaps the most important buildings during the medieval period were the parish churches. There are three surviving in this parish, each one originally the centre of life in its own parish. Perhaps the oldest is St German’s Church (NHER 2253) which is thought to have Norman origins. The earliest surviving part is the base of the tower, which may be as early as the 13th century, though the majority of the church dates to the 14th century. Inside a number of interesting bench ends survive, depicting the Seven Sins. Also retaining some early work is St Mary the Virgin’s Church (NHER 2252), which is now derelict and in the care of the Churches Conservation Trust. Two Early English style doorways survive on the south and north sides of the nave, although the rest of the building appears to be Perpendicular in style and date. The church is host to what may be the most complete collection of early 15th to early 16th century bench ends in the county, and has an interesting large eagle lectern dated to 1518. St Peter’s Church (NHER 2284) has suffered more under the ravages of time, and was deliberately ruined after it fell into disrepair. Today the roofs, window glass and tracery are all largely missing, but the structure is safe and open to the public. Having been only ruined relatively recently, details such as the human and animal corbels and headstops, window seats, sedilia and piscina all survive. No other medieval buildings survive today, but the earthworks of three possible trackways (NHER 21403, 21938 and 21939) and a medieval sea defence bank (NHER 21807) are all recorded. Although no secular sites are known for sure, the site of a possible medieval moat (NHER 2285) is recorded, and it is thought that Eaubrink Farm (NHER 25331) may cover the site of a moated enclosure recorded on 19th and early 20th century maps. This may represent the remains of a medieval manorial site. Other recorded medieval sites include Fritton Oak, which was the site of the Hundred Court for some time and may also have been the site of a chapel dedicated to St James (NHER 2250), as well as a place referred to only as ‘Wathden or Waterden’, which may have been the site of a medieval or earlier churchyard (NHER 14902). In addition to this evidence, extensive fieldwalking has recovered pottery sherds from across this parish. Of particular interest are the twenty-two concentrations noted. These are situated close to Wiggenhall St Germans (NHER 23570, 22102, 22514 and 22515), as well as around Wiggenhall St Mary the Virgin (NHER 22303, 22304, 21939 and 21938), the Eaubrink area (NHER 21391, 21371, 20996 and 21940) and the Pinfold Green area (NHER 23049, 23579 and 23146). Post medieval pottery sherds have also been noted in similar distributions. Other objects of interest recovered from the parish include a 14th or 15th century dog’s head spout (NHER 19127), an early medieval silver chalice and paten (NHER 2247), and a gold post medieval mourning ring (NHER 42715). A number of post medieval buildings have also been recorded, and one of the earliest is Fritton Oake (NHER 2250), which is cruciform in plan and was constructed in 1577 with two polygonal angle-turrets. Also of 16th century date are the remains of St Mary’s Hall (NHER 13298), the gatehouse and stable block of which survives the hall, which was demolished around 1800. A little later is St German’s Hall (NHER 4002), a Georgianised late 17th century house with a 17th century square garden house. Surrey Street Cottages (NHER 4001) are also of interest, containing as they do a late 17th century public house, a late 18th century public house, and some 19th century cottages constructed using clay rather than mortar. From the mid 18th century, Bank House (NHER 31866) survives on the western bank of the Great Ouse River, and is sunk below the flood bank. World War Two also had its impact on the parish. An anti-aircraft battery site (NHER 21812) is known, and two spigot mortar emplacements are thought to survive (NHER 28457 and 31865). The parish is also the site of a Hurricane plane crash (NHER 21899), which flew out of Sutton Bridge with a Polish pilot and suffered a midair collision in 1940. From more recent defence history, the site of a Cold War Royal Observer Corps post (NHER 35428) is also recorded. Knott, S., September 2005. ‘St Germain, Wiggenhall St Germans’. Available: http://www.norfolkchurches.co.uk/wiggenhallstgermans/wiggenhallstgermans.htm Accessed: 3 September 2007.